Petrol, which in Delhi was cut to Rs 81.50 on 5 October climbed to Rs 81.82 on Sunday 7 October 2018 and Rs 82.03 per litre, up 21 paise; diesel Rs 73.82 per litre on Monday, up 25 paise. Delhi did not participate in the Rs 5 per litre reduction the Bharatiya Janata Party (BJP)-ruled states had announced but it benefitted from the central government’s reduction of central excise on petrol and diesel by Rs 1.50 and oil marketing company’s Re 1 reduction in its commission. Much the same is being witnessed across the country proving that the knee-jerk and orchestrated reduction in taxes is not the solution in the volatile market for oil. 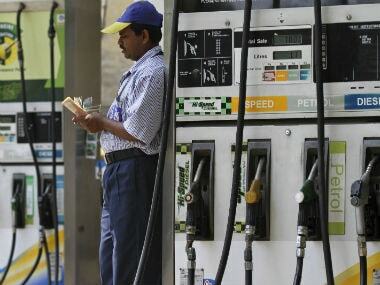 Evanescent and fleeting relief from the relentless rise in fuel prices only invites derision. The Narendra Modi government should not expose itself to yet another charge of jumla (non-serious promise or relief). On the contrary, it needs to address the issue with the seriousness it deserves. To be sure, with as much as 80 percent of the crude being imported, India does not have many options or opportunities on the external front. The oil-for-rice deal is a step in the right direction. India is all set to enter into a fresh rupee trade agreement with Iran in order to overcome the US ban against making dollar payments to Iran, which kicks in with effect from 4 November 2018. Iran accounted for about 16 percent of India’s oil supplies in 2017-18, supplying about 23 million tonnes; while Venezuela accounted for another 11 percent, supplying over 18 million tonnes in India’s total oil imports of about 155 million tonnes in 2017-18. Petrol station. Representational image. Reuters. Venezuela is our fourth-largest oil supplier after Iraq, Saudi Arabia, and Iran. It is nearly broke with hyperinflation ravaging its economy and its currency, Bolivar. So much so that its government has issued the first-ever sovereign crypto-currency 'petro'. The Reserve Bank of India (RBI) is dead against crypto-currencies, and India can swing a deal with Venezuela, too, for the supply of oil in return for food and medicines. Strange as it might sound, the solution for the vexed hydrocarbon fuel seems to be lying in Indian agriculture at multiple levels. Iraq can be similarly persuaded to accept wheat for oil. Russia, which unlike Venezuela is not far away geographically, must be wooed with Indian rice (which seems to be tickling taste buds across the globe) as well as other goods and services. And at the other level of fuel mix, optimum biofuel mix led by ethanol up to 25 percent brooks no delay. Indian farming indeed can bail out the nation from its desperate situation. It will almost serendipitously restore agriculture to its primacy and lift its share in the GDP from the abysmal 17 percent significantly. Mother Earth hasn’t been bountiful to India in terms of the oil reserves but it has been a veritable cornucopia when it comes to farm production. We must fire on all four cylinders to meet the oil crisis with fresh initiatives on the farm front. Indian Oil Corporation (IOC) and other oil marketing companies can enter into contract farming in order to get the rice and wheat to pay for oil and ethanol for biofuel mix. For IOC this would be any day less daunting than finding greenback for oil imports. The taxation policy should also decisively move away from targeting the sitting ducks. Petroleum products are sitting ducks in view of their inelastic demand which emboldens the government to tax it as it pleases as evident by the approximate 25 percent central excise and approximate 25 percent state VAT on petroleum products together accounting for nearly 50 percent of the petrol bunk price. Direct taxes are growing at a healthy clip on the back of the Goods and Services Tax (GST) and demonetisation. The government should go for the jugular---revive wealth and inheritance tax on the rich so as to compensate for the loss of revenue which bringing of fuel into GST portends. Non-tax revenues like from tourism and its sub-set medical tourism as well as disinvestments must also be tapped fully. Delhi metro is an example of how to wean away the public from fuel guzzling and polluting personalized transportation. Even smaller cities should take a leaf out of Delhi. Electric buses must replace diesel buses. In other words, we must strive to reduce our oil imports.